Sourdough Pizzas - As Good As Home Oven Pizzas Get! 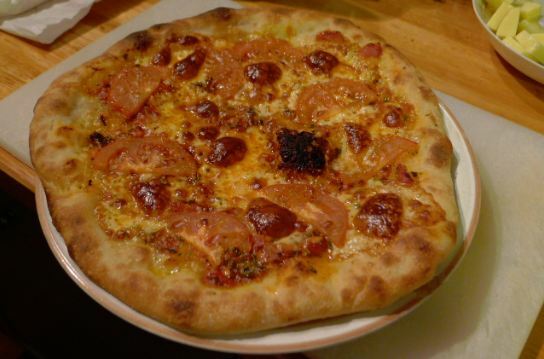 Back in July 08, I wrote a post entitled Making Your Own GREAT Pizzas At Home. I had experimented with multiple pizza recipes before developing one I particularly liked, and with further tweaking over a period of months was consistently getting results that I was pretty pleased with. My pizzas were on a par with all but one of my favourite local pizzerias, and given the restrictions of a domestic oven, I was chuffed with that. Naturally, I slipped into evangelical mode and posted my recipe on the web for anyone interested. The response was underwhelming, although a few folk emailed me privately to enthuse after trying the recipe. But there were hundreds of pizza recipes on the web, I reasoned – why should massive tribes of pizza pundits flock to my blog? I sulked vaguely for a short time, then got on with enjoying my home-baked lil’ luverlies. It took all of 20 seconds browsing to conclude that Varasano was a bona fide pizza maniac! He had travelled the world in search of the best pizzas, researched the Italian masters, and wrote in a didactic tone that resisted challenge. As I pored over the site, it quickly became apparent that the man was no web blowhard. He was obsessed with pizza, and a genuine authority. His quest for the optimum pizza made mine look petty indeed. And one of his paragraphs seemed to point an accusatory finger directly at me! I dunno who Sally is, but I do know that the dough recipe Varasano was dissing with such contempt was pretty close to mine! And I had to admit that his claim was correct that the numerous dry yeast pizza dough recipes strewn over the web are, indeed, pretty samey. I had made a few small changes, including adding a little rye to the dough, but really, my tweaks were just tweaks. Now, here was someone claiming he had something different, more authentic, better! I read the site and re-read it, and the excitement mounted. He was advocating using sourdough starter in the dough! I had recently started baking sourdough bread at home, and was already an addicted breadhead. Anything sourdough was electrically charged for me. Add pizza and the equation was combustible. On the edge of spontaneous immolation, I spoke sternly to myself. I’d be reduced to smoking ashes soon enough, relatively speaking (which hopefully means a couple of quality decades ahead yet!). So I calmed down to hyper, and set off on a new quest for a home-baked pizza that smashed through the dry yeast barriers to new levels of yumdom. Jeff Varasano’s recipe was my starting point, and I fully acknowledge him for showing me the way, the truth and the light of home-baked pizzas. I’ve slightly increased Varasano’s recommended dough hydration, and have adapted his technique to suit my preference for hand-mixing (he uses an electric mixer). This adaptation has necessitated including a small proportion of olive oil in the dough – if anything, I think this enhances the flavour. My topping preparation is also a bit different from Jeff’s. I stopped short of following his recommendation to tamper with the oven to elevate its maximum temperature to 500C! While I admire and respect that sort of fanaticism, I quietly contend that it is entirely possible to turn out wonderful thin-crust traditional-style pizzas from an unmodded domestic oven. Not charred at the edges and super-light, as is only possible at 500C+, but still up with the best I’ve had at commercial venues, and immeasurably superior to the crappy things franchises like Dominos, Pizza Hut, etc sell by the millions (how’s that for lowering the bar?). Not as good as the incredible thin-crust ones I had from an old woodfired oven pizzeria near the Trevi Fountain in Rome, but not far off, either. I say this not out of boast, but as a pizza tragic (although not on Jeff’s level!) speaking on a wavelength shared by others of my kind. You’ve gotta try this! Alright, here we go. You’ll need a sourdough starter, which if you’re starting from scratch will take 7 to 14 days to develop to full leavening capacity. Follow the directions here, and you can’t go wrong. Baking Sourdough Bread At Home: A Beginner’s Guide. *I use a 100% hydration white starter, or rye/white flour starter. The proportion of starter used here is very small, so the starter hydration is not crucial. 1. Mix all ingredients except salt, cover and rest for 20-40 mins (autolyse). 2. Add salt, and do 20 or 30 stretch-and-folds in bowl with a plastic dough scraper. 3. Pour about 1 tbls olive oil on to bench surface, scrape dough on to bench, knead/squelch between fingers and stretch this way and that until oil begins to be absorbed (2-3 minutes). Change kneading method to “air kneading” (slapping dough repeatedly on bench – see youtube demo video below). 4. If sticking too much during air kneading, add more oil to bench surface and repeat 3. 5. Repeat 4 until gluten is well-developed and dough is smooth and stretchy (but it will still be quite a wet dough). This should take about 5 minutes in total, but always go by dough feel. Return dough to lightly oiled mixing bowl, cover, and rest 20 mins or so. 6. Divide dough into however many pizzas you’re making, using a scale to ensure each piece is equal in weight. 7. Roll into balls and transfer each into its own small lightly oiled plastic container, roll around to cover evenly with oil, and put on lid. 8. After short rest, transfer to fridge. Retard fermentation in fridge 2-3 days (I prefer 3). Watch the entire video and as the gluten develops you’ll see the dough transform from a sticky blob to a lovely, manageable, well-integrated dough. 1. Take dough out of fridge about 1 hour before baking (pre-heat oven and pizza stone to max temperature possible during this time). When dough has returned to room temperature (45 minutes or so, but could be shorter or longer, depending on ambient temperature), empty one dough ball on to moderately floured surface. Forget about showing off that pizza dough tossing technique you’ve been working on – this dough is far too wet for that. Instead, gently and gradually stretch the dough evenly with your fingers, working from the centre out, leaving a small rim at edges. Be firm but not rough – the dough should be very manageable and stretchy, but be careful not to stretch it so thin it tears. 2. When at the size and thickness you want, transfer to semolina-sprinkled peel (or back of cookie sheet). This transfer process can be a bit tricky. I get my partner to lift one side of dough while I lift the other. It will distort in shape in transit, so re-shape when on peel (not always easy – but who cares if it ends up ‘rustic’ in shape, anyway?). Keep giving the peel a shake to make sure the dough is not sticking. If it does stick, work a little more semolina under the sticking part. It is vital to keep checking that it is not sticking as you put the toppings on. I have made the mistake of assuming a tiny bit of sticking shouldn’t matter, that the weight of the pizza would free it for launching with a bit of jerking of the inclined peel and send it sliding cleanly on to the pizza stone – I was spectacularly wrong! (The stuck part remained anchored to the peel while the toppings and rest of the dough ended up in a mess on the hot pizza stone – try cleaning that up after you stubbornly went ahead and decided it was a sort of open calzone you were baking rather than a pizza!). Yup, if the dough sticks to the peel AT ALL, EDGE SOME SEMOLINA UNDER THE PROBLEMATIC PART UNTIL IT DOES NOT STICK ANY LONGER!! 3. Drip olive oil over the dough and spread it evenly with your fingers. Next, swirl a bit of tomato sauce over surface and thinly spread. Quickly assemble your preferred toppings. KEEP TOPPINGS LIGHT! Then transfer to pizza stone in maxed-out pre-heated oven. 4. Bake about 8-10 mins max (note: the thicker the dough and spread of toppings, the longer it will take to bake; I like thin crust pizzas lightly topped, so mine only take 8 mins @ 250C). 5. I like to serve mine with freshly ground black pepper over the toppings, and scattered with torn basil leaves, with some chopped fresh chillies in quality extra virgin olive oil spooned over. See: Making Your Own GREAT Pizzas At Home. And remember, for thin-crust traditional-style pizzas, LESS IS MORE. Load the toppings on and you risk ending up with a soggy, half-cooked pizza. Bake it longer to compensate, and the rim will be over-baked and too brittle. I don’t take great pics – poor lighting in the kitchen, and I’m too impatient to start eating! These don’t do justice to these pizzas, but will give some idea of the way they turn out. Yes, the degree of difficulty of these pizzas is higher than that of the dry yeast versions. Yes, the time involved is days, not hours. And yes – it is worth the extra effort! Tip 1: Try par-baking your olive-oil-spread pizza bases for 2 minutes or so, then remove carefully from oven and put on toppings before returning to oven to complete the bake. Par-baking gives a nice bubbled crust effect. Tip 2: For last 2 minutes of bake, turn on your griller (‘broiler’ is the term in the States, I think). This will give you a char on the edges, similar to a wood-fired oven (but not as good, since you don’t get the same hint of smokiness in the flavour). I don’t see myself going back to dry yeast pizza dough, but there is a short-cut alternative for those who might baulk at beginning a wild yeast starter culture just to make pizzas: a biga or poolish, which is basically a starter made using commercial yeast (dry or compressed). Whether you use a natural or commercial yeast pre-ferment, the secret to more complex, developed flavours is to retard fermentation of the dough overnight or longer in the fridge. I’m not much interested in exploring the use of a commercial yeast biga. Why would I be, when I have a gloriously active wild yeast starter that I fawn over like a pet and that serves me so well? As ever, though, the choice is yours. Just don’t harbour the delusion (as I did before I knew better) that those dry yeast pizza bases are as good as it gets – they ain’t! Not out of a domestic oven, at least. Sourdough pizzas are top of the wozzer. Try ’em! Find this post useful? Buy me a coffee (if you’d like!). Long live the art of sourdough and more importantly, the culture of people cooking for themselves. Perhaps the pendulum is now swinging back from the days when apartments in the US were being built without kitchens (I can’t prove that this was the case in the 80s and 90s so it could be a false memory)to an earlier time. Baking your own bread is taking it a fair way further than Orr’s recollections but then again, bread in the 1950s and earlier was far less of an industrial product than it is today – it was proved for longer and had a lower glycaemic index. In any case, what price the deep and almost visceral pleasure you seem to get from baking bread and then enjoyng the fruits of your labours? Well said, Bananaman. And yeah, the profound satisfaction and pleasure to be derived from baking your own bread for yourself and others – and especially, I say, sourdough – cannot be quantified in any but the most personal terms. And under ‘bread’, I include pizzas. Anyway yours looks great, glad to see someone used normal home oven temps and got good results. Even more important, glad to see Varasano’s behemoth recipe/advice distilled down to something manageable! My oven (electric convection) goes to 500F = 260C. I was also thinking I could try the convection(fan-assist) which may act like a somewhat hotter temp, though maybe that would affect the toppings more than the crust. I do know my convection is supposed to be ‘true convection’, i.e. it has an actual element built into the fan, although that may be more for manufacturer marketing than real benefit. But I don’t think I will be cutting my self-clean safety latch off anytime soon — though I do wish I could override the oven to go higher than 500F! Sorry about this delay in responding – a bit slack lately. Thanks for your kind acknowledgment. Pls post back when you’ve tried this SD pizza for yourself. I am constantly amazed at just how good it is when I get it just right (which is not all the time…lots of variables involved). Re having the convection fan on: yes, it does give you a higher oven temp, but I find you still need around 8 minutes, and it dries out the toppings. I never use the fan, either for pizzas or bread. Always worth experimenting yourself, though, as ovens have their idiosyncrasies. Hi Mara, and thanks for your comment. I can only imagine how good this SD pizza would be coming out of a WFO @ 500C – 2 mins baking time, and you should end up with the lightest of crusts, charred a little at the outer edges. If you try it, pls lemme know how it turns out. Many happy pizza bakes to you! Hey well done on experimenting with the “masters” pizza recipe. I remember the (slightly shocked) sense of awe I felt when I first stumbled upon his site. The first time I tried it I was too impatient to wait the three or more days of resting in the fridge – disaster. One forgotten ball of dough at the back of the fridge discovered five days later turned out a magnificent pizza. Since then i have had mixed results with a modified version of his recipe. My latest discovery is to cook them on a pizza stone in my new webber gas bbq which has a lid. I can crank the temperature right up and keep it there. So if you have a bbq with a lid give it a try. (I too have been lusting after a wood fired oven for too many years to count!). I will try your recipe next time with the tiny bit of commercial yeast. I have only done sourdough so far. Hi spice and more, and thanks for your comment. I’m not sure if Varasano really qualifies as a “master” pizza maker (some of the reviews from folk who have sampled his pizzas at his commercial outlet are less than ecstatic) – but there’s no doubt he is a bona fide authority due to his exhaustive research and fanatical quest for pizza perfection. And there’s no doubt that this sourdough recipe yields outstanding results, better than any dry yeast version I have tried (and I’ve tried and experimented with quite a few). I don’t have a BBQ with lid, unfortunately, so won’t be able to try that. By all means, give my method a go, and why not try it with your BBQ as well? I’d love some feedback on how that compares with 8 mins in a maxed-out domestic oven. NB: I have tweaked my dough hydration to the point of finding the optimal consistency for the flour I use. My simple modus operandi was to start with Varasano’s dough mix, and increase the hydration each time I made pizza (by reducing the flour by 5 grams per time). Eventually, I reduced it 5 grams too much, and ended up with a dough that was just that bit too difficult to work with at the final stage, and gave no better results in terms of lightness, openness of crumb and flavour. However, while my mix is perfect for my flour, you will probably find you need to tweak the flour quantity a little to find the hydration sweet spot for the flour you use. The big breakthrough in my method is the use of the olive oil during the kneading stage. This is the factor that makes Varasano’s recipe work well for my hand-mixed dough. If you use an electric mixer, as Varasano does, you might as well just follow his mix and tweak from there. Anyway, lemme know how you go. PS: I have tried this recipe without the addition of the tiny quantity of instant dry yeast, and while the finished pizza base retains its fantastic flavour, it’s not quite as light or airy. Still nice, though. oh yeah I wrote “master” with my tongue firmly in my cheek! Obsessed is more like it. Hey spice and more, I bake SD bread several times per week, and I use a cheap set of digital scales I got from Target after noticing that Choice Magazine recommended them as a value buy. They cost under $50 and measure accurately to within a gram. They do use batteries, but that’s the only downside. Otherwise, I couldn’t be happier with them. I can help with the soggy crusts you’re getting with your SD bread. Pls email. Maybe you can help me with an absolute killer vindaloo or Madras curry chicken recipe? I have done a lot of Indian cooking, but just can’t get a genuine vindaloo/Madras curry (ie: without using commercial paste or curry powder additions to my spice mix) to pack a massive flavour punch like the really good ones I had in India, Malaysia and – wait for it – London. So, pls email me (I can’t find an email address on your blog site, or I would email you). I have made these twice and am very pleased with the results after having a disappointing experience with another sourdough pizza recipe. I followed your technique but left out the yeast and baked them on the hotplate in my barbeque. Superb! Light and crispy bases that complement the thin fresh toppings that we prefer. Have made Jamie Oliver pizzas for years – tasty but slightly bready for my liking. The fridge rest in your recipe gives the dough manageability and predictability. Went on a course in February but my sourdough loaf success has been a bit hit or miss so far. Hi Lara Ann, and thanks for your acknowledgment. Glad to hear that you also find the flavour of this dough superb. 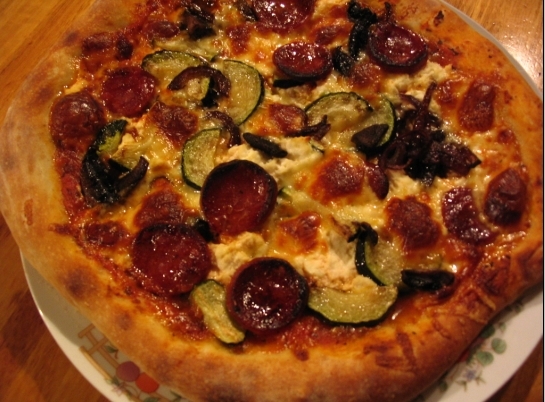 I’ve used Jamie O’s pizza recipe also, and agree with you about the ‘breadiness’ aspect. Really, it’s just another of many such pizza dough recipes – dare I say it, the very ones Jeff Varasano advises us to “run screaming from”!! Mr Varasano is a pizza fanatic and extremist of the first order, of course. Standard dry yeast pizza doughs like Jamie’s are nice enough…but this sourdough version is way better. The retardation in the fridge allows flavours to develop in all their complexity, not to mention the beautiful flavour qualities that only natural leaven can impart to a dough. I’ve also made this dough without the added dry yeast. When you’re baking in a domestic oven, I think the spring is a little lacking without the dry yeast spike, but since you’re using a BBQ hotplate I imagine you’re getting a higher intensity of heat, which would push up the dough as only higher temperatures can. Just curious – do you bake one side on the hotplate, then flip and remove the base to add toppings to the baked side before browning the underside to finish off? I know lots of people swear by BBQ hotplate pizzas, but I’m a bit put off by the interruption to the bake. Also, I imagine you have to grill the toppings once the pizza base is done? By the way, I’m right with you on light toppings. Less is certainly more with pizzas! The real star of the show with pizzas is the dough, and as you’d be well aware, weighing it down with toppings ain’t no good if you’re after a light, airy, evenly-baked base (and who among true pizza freaks would not be after that?). I’ve been invited to a bake-off using a wood-fired oven in a couple of weeks time. Looking very forward to seeing how this sourdough base turns out under ideal temperatures. Re sourdough bread, have a look at my Beginner’s Guide To Baking Sourdough Bread At Home post. Not implying you’re a beginner – rather, in that post you’ll find a link to a recipe for Norwich Sourdough. Not only is it foolproof, but the resulting bread is just gorgeous. I’ve developed another one, even simpler, that is better still – at least to my taste. I’ll be posting it on this site in the near future. Best of baking to you! Thanks for publishing this in such detail – I’ve read Varasano’s page a few times, and I like the mods you’ve made to his recipe – will try it real soon. Something that really helped my pizzas (apart from my wood-fired oven) has been moving to Allied Mills “Superb” flour – I know it’s available in WA; it’s amazing value (around $13 for 12.5 kg) and just brilliant for pizza dough. G’day Mick, and thanks for your comments. Yes, I’ve been meaning to buy a bag of Allied’s flour ever since I noticed it in the background of a photo accompanying a feature article on Little Caesar’s pizzas. I figured that if it’s the flour of choice for an award-winning pizza place like that, it has to be good. Your comments have just re-inspired me to seek out a bag and give it a go. Out of interest, what other flours have you tried? Yes, I know how much difference a WFO can make. Good on you for building your own – looks great. It’s been a dream of mine for years to have a backyard WFO, but recently I’ve been wondering if it’s worth the effort. Don’t get me wrong – I have no doubt about the magnificent results of wood-fired heat. I just have some doubts as to how much I’d actually use it, given the learning curve and long prep time prior to a bake. In the States, there are some councils that provide community WFOs. Now THAT’S an idea for some local bodies…but I fear they’re more committed to impressing themselves leaving their mark on their local communities with coloured street signs, sculptures that no one likes and public exercise equipment that no one uses more than once…oh well, it’s only rate-payers bucks! I just had a quick look over your blog – we have some shared values. I’ve been using an IDY biga prior to this – can’t wait to try the sourdough. Apparently the place to get the Allied Mills Superb is Variety Foods in Perth – you really should check it out! I’ve used most of the flours available in the mainstream supermarkets but Superb blows them away. I find the wood-fired oven not too bad to manage. It takes about an hour to get pizza-hot, but the pizzas cook so fast so you can feed a stack of people really quickly. I’ve baked bread twice, but still getting used to managing that. Stumbled on your site as I wait for my dough. We’ve followed a very similar path. I bought some fire bricks so I could try and make a quasi-brick oven on my backyard grill. I feel the way that you do about my pizzas. They’re better than most pizza joints, but definitely not the quality of a good brick-oven restaurant. And that’s fine. This isn’t my job. The fact that our pizzas are better than the vast majority of pizza places is ridiculous. It shouldn’t be that way, but it is. Regardless, I do love making them, so life is good. Hiya Mark, and thanks a lot for your comment. Great to hear from a fellow home baker of sourdough pizzas who is on the same wavelength. Needless to say, I agree with everything you’ve written. I keep trying other pizza dough recipes from time to time – including the “run screaming” varieties that Vasasano warns about. Every time, I return gratefully to my sourdough version. It’s simply superior in flavour, and when you get one just right – well, about as close to WFO glory as it gets in a domestic kitchen setting. Sometimes I portion off some bread dough for pizza when I’m making a high hydration bread, and that’s really nice, too. Anyway, long may you keep your family and neighbours well supplied with gorgeous home-baked sourdough pizzas! LOVE this pizza dough! I’ve been making it once a week for months now. Thank you thank you thank you! If you put a piece of parchment between the dough and the peel you can easily slide the pizza with parchment onto the hot stone. No worries about the dough sticking at all. The parchment gets a little brown but doesn’t interfere with the cooking or anything. Hi Saskia – and thanks so much for your generous acknowledgment. I’m thrilled that you are enjoying your SD pizzas as much as I do. I must apologise for this delay in responding to your comments. I’ve been away in Vietnam for a month and only logged on to the blog every so often. I can certainly understand why you use parchment. I do the same with my SD bread. With these pizzas, though, I prefer the baked base finish that you get from loading the pizza directly on to the pizza stone. I’ve had my disasters, but over time have developed the knack of sprinkling just enough coarse semolina over the peel to prevent sticking, and also keep checking that the dough is sliding freely by giving the peel a little shake. If you’re going to use parchment, as Mike says best to yank it out from under the pizza as soon as you can (I do this with bread about 12 minutes into the bake, but of course with pizza you have far less time). Mike’s method sounds easier for pizzas, and no doubt yields just as good a finish as I get from baking directly on the stone. For me, the most challenging aspect to these pizzas is getting the dough off the floured bench and on to the peel for topping. I call for an extra pair of hands when I’ve stretched the dough out enough, and that makes things far easier. Dunno how I’d manage by myself, actually! Then again, I am constantly pushing the hydration boundaries and making the dough wetter in quest of that super-airy crumb we home-bakin’ pizza tragics dream of. Anyway, hope you continue to enjoy your weekly pizzas. It’s a ritual I’d be loathe to break now! Pretty addictive, this home-baked pizza thang! BTW, have you tried pizza bianco? I find I am leaving off the tomato sauce topping more often than not these days. LOVE super-thin slices of potato marinated in EV olive oil, then spread thin over the pizza base and topped with fresh chopped rosemary and a bit of grated hard cheese (I prefer pecorino or romano to parmesan). Simple, but o so yummy! A white base spread with EV olive oil and topped with prosciutto and rocket, with maybe some split olives and a light sprinkle of grated pecorino or similar, is also one of my all-time faves. Must stop! Great to hear from ya again and best of baking to you! And you too, Mike. No worries about not responding sooner, today is the first time I checked your site again since posting. Good timing! Thanks about the tip on removing the parchment after a few minutes. I’ll give that a try this week. And will also do that for my sourdough bread. I’ll play around with the hydration level of the dough a bit as well, even though I am still impressed every time I make it how airy and crispy it is! I hardly ever put tomato sauce on my pizza. Never been a big fan of that for some reason. Must try the thinly sliced potato variety soon! I love potatoes in every way, shape and form 🙂 I’m also addicted to onions and garlic so I often top the pizza with EVOO, very thinly sliced onions and garlic, cheese and fresh herbs. I think a combination of potatoes, onions, garlic and cheese would be delish, too! Oh yeah, I’m with you on potatoes, Saskia. And onions and garlic. Thank you so much for publishing this in so much detail, can’t wait to try it. I’ve never made a pizza, but only this afternoon I was discussing pizza’s with a friend, who immediately recommended the run-from-it recipe. Of course that’s out of the question, I’m a SD maniac :). So I just went over to TFL, and lo and behold, there was your link! Like Lara Ann I’ll probably leave out the yeast. Very rude and negligent of me to not respond to you, J. Dunno what happened, there. I didn’t notice your post for some reason. Apologies! If this recipe and set of directions ends up being what you’re looking for, glad to have been of help. And yeah, do let me know how it went once you’ve tried it. Hi Craig, and thanks for your comment. The olive oil is only spread on the benchtop so the dough doesn’t stick when you’re kneading it (none is added to the dough earlier). You’ll find this dough is pretty wet and sticky to begin with, and without the oil on the surface kneading would be problematic. As you work the dough by squelching it between your fingers to begin, followed by slap kneading on the benchtop, you’ll find it begins to come together, although it will still be sticky. It’s a pretty high hydration dough – far more so than the usual yeasted pizza dough. Interested in how your pizzas turn out! Awesome! Thanks a bunch for quick reply. Will be sure to post the outcome. take care! Very interesting looking recipe (and I am in the middle of making it) but the quantity of salt seems excessive, as it does in Jeff Varasono’s recipe. 3.5% seems about twice what I would expect. Doesn’t this lead to an over-salty tasting base and perhaps it might not be considered best practise in health terms? The 5gm of salt as per the recipe above is 2.9% – or 1.7% by total weight – which is around the middle of the suggested range of 2-3.5% (bakers %). In fact, I use only about 1.5% (baker’s %) in all my pizzas and breads, and very little in my general cooking, because my partner is on a low salt diet due to a medical condition. I figured most readers would not be on a low-salt diet as rigid as ours, so went with the 5gm salt quantity I used to use. In my recipe above I did put a qualifier in parentheses – “or to taste” – next to my suggested 5gm of salt. So yes, exercise your preference and lower the salt to whatever you feel is appropriate for you. I completely agree that Varasano’s 3.5% is too salty, health concerns aside. Pizza dough doesn’t need to have as much salt as other breads because toppings tend to be high in salt content and thus provide the flavour balance in this respect. One thing is certain: any DIY pizza can be adjusted without compromising flavour to be far lower in salt than the vast majority of retailed versions. Please let me know how your pizza turns out! NB: I’ve adjusted the recipe further since posting it, and have been meaning to post the tweaked version. Will do so soon. Thanks for your prompt reply, Rolanstein. I settled on 3g salt per pizza, or 1.85 bakers%. This seemed about right to me. With bread I usually use 1.54%, so it’s in the same area. 1) What do you use for the tomato covering? I tried Varsano’s method of pureed tinned plum tomatoes (using a stick blender), minus the green bits and seeds and really I think it was too watery. It was actually worse than using ready made passata. I might add some puree next time to thicken it up. 2) I always seem to have a problem with the mozarella browning before the base is crispy on top. I am using a fan oven, as I like to get consisent temperature throughout the oven, so I can bake more than one pizza at once. Could it be to do with this? I had the temperature set at 250C – about as high as it will go. Also I have found that more mature doughs, eg fridge proved for a day or more, seem to have more difficulty in crisping up than a freshly made dough. 3) I am not convinced that I am seeing the benefits of the sour dough pizza base compared to a standard yeasted one (heresy!). Because the base is pretty thin, I find it difficult to actually taste the sour dough. What do you think? 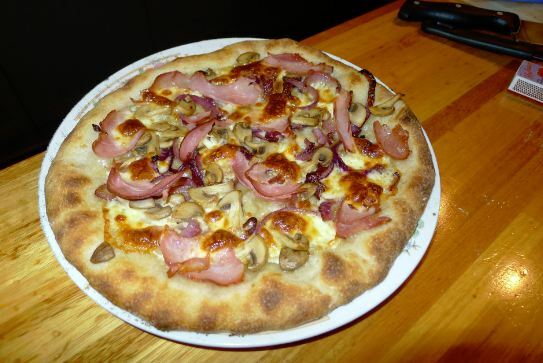 Hi Lance and Rolanstein, I’ve made this dough quite a few times over the last couple of years – it’s a really tasty dough, but I bake in a woodfired oven and it springs right up and the dough taste certainly becomes quite prominent. When I don’t have sourdough starter ready I usually go with Peter Reinhart’s Neo Neapolitan dough, with a 2 or 3 day ferment. Regarding tomato: when baking in the wood oven (at well over 400 degrees) I use a raw tomato sauce – put canned diced tomatoes in a colander, put some sugar and lemon juice on top, and let drain for an hour. All the bitter liquid drains out and you are left with a fairly thick and sweet sauce. For a cooler oven I’d probably go with a cooked sauce. I’ve baked this pizza in a WFO only once, Mick. You just can’t beat fast-baking at those high temps and the smoky char. And as you say, the lift you get from a WFO is terrif. I reckon WFO pizzas taste great, whether the dough is SD or made with dry or compressed yeast, as long as the dough is a good one and your toppings light and appropriate. And I agree that if you’re going with dry or compressed yeast, an extended fermentation will extract maximum flavour from the wheat. Same with SD, for that matter. It’s a whole different thang, baking pizza in a domestic oven. Which brings me to your most recent post, Lance. Re tomato sauce: I don’t spend much time on this, these days. I often don’t use a tomato sauce topping at all. But when I do, I either spread on some leftover home-made pasta sauce (just a simple Neapolitan style sauce, or for a real treat matriciana), or use a thick store bought passata. I only buy good quality Italian ones. There are some crappy watery brands out there, and if you’re unlucky enough to be stuck with one of those, bring to the boil in a small saucepan and reduce until it’s the right consistency. I always sprinkle our backyard dried oregano over the pizza base, which I first smear with EVOO, then I add the tomato sauce if using (thinly spread with fingers). Our oregano is far more pungent and flavoursome than any of that dust you get in jars from the supermarket, so it works a treat, but if you don’t have dried oregano of this quality probably best to incorporate it into a cooked tomato sauce, along with a touch of sugar, sprinkle of salt and pepper, and maybe a bit of garlic. But really, I reckon a simple thick passata works fine. It’s true that a domestic oven pizza will give you browned mozzarella, because to cook the base properly you need to bake your pizza for at least 8 minutes in a maxed out oven, with the pizza stone pre-heated for an hour. 8 minutes is too long if you want to avoid that browned cheese effect (and for an authentic pizza, you do!). Obvious strategy: add the cheese half way through the bake. I sometimes do that. A side benefit is that your base gets more of a chance to rise with one less topping on it for the first part of the bake. You want a thin-crust base, but with some rise, and of course a light airy rim. Pre-heat your stone close to the top of the oven, then turn on the griller (‘broiler’ if you’re American) for 5 minutes or so to really get some heat into the stone surface. Turn off the griller AND fan, and add your topped pizza, minus mozzarella. Take it out after around 4 minutes, add the mozzarella, and put the pizza back to complete the bake. For the last 1.5 minutes or so, turn the griller back on to get a char on the rim. You’ll need to juggle the timing to get the cheese and char right, but in time you’ll work it out. The above is the best method I’ve tried – turns out pizzas most closely resembling WFO ones. Close, very close, but not quite the same effect! Re the retarded doughs not crisping up as well as others, I think the most important factor is to ensure you give the dough enough time out of the fridge to rise, before shaping and baking. Try doubling the time you’re giving these doughs and see if that does the trick. There are many factors involved in a good pizza. It’s deceptively simple. I’ve found the flour makes a huge difference. I went through every flour available here, including the Italian Tipo 00 ones, before I realised that the best flour for me was sitting under my nose. It’s a local one called Allied Mills Superb. I’d heard about it, but wasn’t motivated to try it until I discovered that it is the flour of choice of the best of the local pizzerias. Once I used it, I soon saw why! Plus it’s only available in bulk, warehouse direct, so it’s MUCH cheaper than those piddly little packets at the supermarket. So, see if you can find out the flour your favourite local pizzeria uses, and track that down. You might be surprised. It’s difficult to zone in on things you might improve without knowing more. Next bake, could you take some pics, including a cross-section shot of a piece of sliced fresh-cut pizza (as per my second-top pic in my post above)? That might offer some clues. Don’t give up! The flavour of this dough is very good if you get everything right. That said, I’ve gone back to the dark side and tried dry yeasted doughs from time to time, and they can be lovely, also. I do think they’re generally lighter than this SD dough. It would be a pity if you abandoned this SD version before you tasted it at its best, though. And BTW, one little tip. If you’re finding the high hydration dough hard to handle, add a little – and I mean a little – more flour to the mix. I’ve found a slightly less wet dough works a bit better in a domestic oven in terms of rise and lightness. For WFOs, I suspect the high hydration really comes into its own, though. That seemed to be the case with my sole WFO pizza bake, at least. Maybe Mick can add some thoughts on this…? Many thanks for your comprehensive responses. You have both given me lots of things to think about for my future pizza making. I might just give Mick’s suggestion of the Neo-Neapolitan a go and try and perfect that before returning to sourdough bases. I often wish I had a WFO, but no doubt this would bring its own variables, and to be brutally frank to myself, Lancashire weather is not the most conducive to outdoor cooking! Rolanstein, interesting what you say about Oregano – I’ve noticed a fair bit of variation in quality, even amongst the bought ones. The best I ever had was one we bought in Portugal, of all places. I think it had been freeze-dried, which seems to preserve the flavour much better. We’re off to Greece on holiday next week, so I’ll see what’s on offer there! Fair comment about pictures; let me produce something I’m a bit prouder of and I will put it up. Just a quick one, Lance. The Greek oregano is the best I have encountered. Very strongly flavoured and stunningly aromatic. I’d be loading up on that while over there! Moving in a few Weeks so may need to build a new WFO. 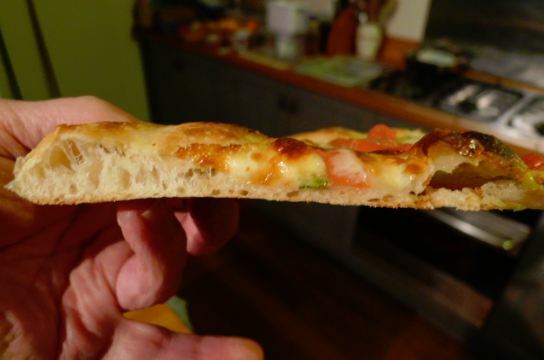 Thanks for sharing this recipe – I have never been satisfied with my breadmaker dough pizzas and recently got into breadmaking by hand with a sourdough starter. I found this recipe at the perfect time, and now it’s my go-to pizza dough that we eat every week or two. Thanks a lot for your kind acknowledgement, Raewyn. I’m chuffed that you rate the recipe so highly that it’s now your go-to. Then again, I shouldn’t be surprised by your response. There’s no doubting the superior flavour yielded by natural leaven and extended fermentation. I am fortunate, I guess, to have started my pizza and bread-baking by hand, and never to have owned a breadmaker. I have tasted a few breads made by people using breadmakers, and IMO none have come close to good hand-made home sourdough bread (assuming, of course, top quality flour is used). Then again, I have to admit to being a sourdough nut. And it’s certainly not the case, of course, that all breads and pizzas using commercial yeast are mediocre. I do think extended fermentation is vitally important though, whether using dry or fresh commercial yeast, or natural leaven. All the best with your pizzas and bread, Raewyn! Hi. Thanks for compiling this great recipe. I’m just about to pop mine in the fridge for the “retarded fermentation” part of the process. Just wondering though, why such little starter? I have a very mature wholemeal starter but I thought the salt kills off the bacteria in the starter in the same way chlorinated water kills off the bacteria, so the sourdough only gets to feed of the flour for 40 minutes before it get clobbered in the head by the salt. Am I missing something? Hi Dan. Good on you for giving this a go. Lemme know how it turns out. The salt in these small quantities isn’t so toxic to SD bacteria that it kills them – it just slows down their activity, and that’s what you want – an extended fermentation to bring out all the flavour in the grain. Retarding the dough in the fridge also extends the fermentation by slowing it down. As for the small percentage of leaven, it’s all a matter of getting the flavour profile and texture you’re after. Every component of the SD process has the potential to affect the end result. For such a simple end product the complexity en route is astonishing. The good news is that near enough can be far superior to most commercial products, as long as you get the most important stuff right. Brilliant. Thanks for clarifying – will report back after Sunday and let you know how it all went. Looking forward to it. Just reporting back. Overall my attempt was pretty successful. My domestic gas oven was a huge limitation and my pizza’s were wonderfully crispy on the bottom but not on top so I had to finish under the grill to crisp the top. I was happy with the flavour but will add more salt this time as I was too gentle before as I was afraid I would kill off the starter. If I had one complaint with my pizza it was that there was not enough air in my dough so I might need to do some more air kneading. I hope to bring this to a commercial level eventually so this is the first of many attempts. I’m using a wholemeal starter and I wonder If I should be using a different flour to enhance the flavour. BTW, I retarded my dough for 4 days, will try 3 next time. Dan, your flour is crucial. Are you in Australia? If so, I really don’t think you can go past the Allied Mills Superb (see comments thread above). Otherwise, might be time to start trying out some of the Italian ‘OO’ pizza flours. Tip: I recommend finding out which flour(s) your favourite pizzeria uses and start with that. Also, the shaping is crucial. When you took your dough out of the fridge, was it well aerated and moussey? It should have been. If so, any lack of airiness in your crust would have been due to the way you handled the shaping. I’ll wait for some feedback from you before expanding. 4 days should have been fine as a retardation period, but I don’t think you need to go longer than 3, or even 2. Longer doesn’t mean better flavour development past a certain point. My pizzas are all white, including the starter, but given the small amount of starter in this dough, I don’t think your using a wholemeal starter is significant to your end result. Finally, sounds to me like your oven is not getting to a high enough temperature. Can you buy a thermometer and measure the heat you’re getting? Are you using a pizza or baking stone? Dan, I have to admit, I’m not a fan of the Anchor Lighthouse flours. See if you can track down a 12.5kg bag of Allied Mills ‘Superb’, or whatever your fave pizzeria uses. Believe me, flour makes a big difference. Also, go and buy yourself a pizza stone. It’s a small outlay that makes a significant difference. I usually pick them up for $5-$8 on special, and keep a spare. One lasts me about a year, but I do a lot of baking – not just pizzas but bread and other stuff. Probably average 3-4 bakes per week at maxed out oven temps. If you do less than this, a stone will probably last you 2 years plus. Apart from a dough scraper, it’s about as good an investment as you’re likely to make as a home baker. There’s a link to a video on pizza shaping I think you might find useful. Gimme a bit of time to see if I can find it, and I’ll post it here. Just wondering, what happens to your pizza stones that they fail? These days I don’t bake on mine much since going gluten-free/“paleo” a couple years ago, I just do gluten-free pizzas about once a month. But before that I was baking big batches of sourdough bread once a week, 5-6 loaves per batch, plus pizza fairly often. This was at maxed out oven temp (530 F). And my stones have lasted for years! G’day Mike. My stones just crack apart after a year or so. Might be 1.5 years, even (I don’t have a good sense of chronology! ), but certainly less than 2. One of them cracked in two as I took it out of the oven cold, the others I just found cracked in half sitting cold in the oven after a bake. No idea why yours last so long. Maybe you buy better quality stones than I? My last one was Avanti, cost $5 on special. I can’t remember the other brand I’ve had, but I’ve never paid more than $8 (always on special). Just curious – what’s your brand? I notice bakers in the States complaining about the expense of their stones – seems they go for around $30 over there. Not always the case that pricier = better, but I guess that means they’re better quality than the ones I buy here. He’s doing a different style and shape of pizza, but his shaping technique is spot on I’ve found (I sprinkle on less flour than he does, though). Study his method here, and apply it to your own pizza shaping, and you’ll get that lovely airy crust you’re after. Sensational. Thanks so much. I’ll check out that Allied Mills flour you mention and I’ve just bought a stone. Looking forward to perfecting my dough. Aha! My stone is 0.5cm thick and 33cm in diameter, so there’s the explanation for the differences in longevity twixt your stones and mine. Still, at $5 per throw, I’m happy enough to get a year+ outta mine. That said, your stones sound like top quality jobs, Mike, and no doubt worth the outlay. Thanks for the clarification on this matter. Have made huge progress since my last post. The stone has been an invaluable purchase and I’m really happy with the taste of my dough and the crispness of it. I still have not sourced the “superb” flour but I will keep and eye out. The only thing I’m struggling with is transferring to the stone from my bench. I noticed a lot of commercial pizzerias use a thing aluminium tray to create the pizza and then just pop it on the stone. Seems like it would save a lot of hassle. What’s your view on this o wise one? Good to hear of your progress, Dan. I use a wooden peel ($5 on special) to lay the shaped dough on, top it, and transfer the pizza to the stone in the oven. Of course, the dough will stick to the peel unless you take measures to stop this happening. I sprinkle the peel liberally and evenly with semolina before loading the shaped dough on to it. The semolina functions like tiny ball bearings, allowing the topped pizza to slide easily on to the pizza stone. Only downside is that you end up with burnt semolina (I wipe it off the stone with a teatowel between pizzas, which at least transfers the remnant semolina to the bottom of the oven). Tip: If using semolina, give the pizza a shake from time to time to ensure there are no areas that stick due to uneven spread of “ball bearings”. Don’t make the mistake of assuming that a tiny area of sticking will come loose when you load the pizza on to the stone – it won’t, and you’ll end up with a mess dumped on your stone! Alternatively, you can simply load the shaped pizza dough on to baking paper, top your pizza, then slide the baking paper on to the back of a cookie sheet or similar before transferring it to the stone. I use this method with bread (but with my peel instead of a cookie sheet), and whip the baking paper out as soon as the dough has baked enough to “let go”. Would do the same with pizza. Hi. I’m just wondering has anyone tried this recipe with Spelt flour? I’m wondering if it would work. I think spelt flour is low gluten some I’m wondering if Its worth the effort. Why not give it a go yourself, Dan? Home-baking is all about experimenting and tweaking to get the results you want – at least, for me. I’m not a fan of spelt generally, and in any case suspect it would not be robust enough for the sort of pizza I like and aim for, but horses for courses. If you try it, pls post back with your findings. Will do – I’ll whip up a batch on Wednesday and report back at the weekend with the results. I notice Mr Varasano does not mention spelt in his recipe anywhere when mentioning different flours so I suspect you are right but I’m going to give it a shot to see if I can marry flavour with health in a pie. Fingers crossed. Just reporting back on the Spelt Experiment – It was a raging success. I can’t believe how well it turned out. I used the same measurements as above but the dough was a little wetter and slightly harder to work with. Next time I’ll hold back a little in the water and hope that it corrects the problem. Spelt starts to break down if over kneaded so I just worked on it for about 4 minutes. The result was a lovely crust, rich sourdough taste and that lovely nutty spelt flavour. The base was not quite as airy as would like but I still think that could be down to my shaping which still needs some work – There’s no doubt that the flavour was all there. I forgot to take some pics but I will next time. Pizza just got a little healthier without sacrificing the taste. Good one, Dan. Thanks for reporting back. I assume you were using wholemeal spelt (otherwise, it’s no healthier than white flour)? Whatever, the most important thing is that you are happy with your pizzas. You might find you get a lighter, airier dough by combining spelt with a good high-protein wheat flour. Just a thought. Look forward to some pics. You’ll need to forward them to me – I don’t think there’s any facility to post pics here as a Commenter, but I can do it for you. Hi Rolanstein. I actually used white organic spelt (from woolies). I gather whole grain is much harder to bake with and I doubt the flavour would be great for a pizza. Even white spelt is very nutritious but obviously not a much as wholegrain but still has good bioavailability. It has lower calories than wholegrain spelt and much much easier for the body to break down than bread flour. From what I can gather, white spelt is very high in protein compared to standard pizza dough. I’m a certified pizza freak but the one thing I hate about normal white flour is its binding effect. Without going into detail I certainly did not have this issue with spelt. If you give it a go I’d love to hear how you go on. Hahaha – well, only you can know about the extent of the “binding effect” on your system, Dan! Glad to say I haven’t noticed any such side-effect from white flour. Can’t say the same about the effect of the cals as reflected on the bathroom scales, though. To be honest, I don’t think there is such a thing as a “healthy” pizza – only less fatty, less salty, less empty cals etc. And when it comes to pizza, I’m afraid I am not prepared to think much about the health aspects. Something that tastes that good (when you get it right, at least) adds to the quality of my life, and if there is a quantitative cost, then so be it. I fondly imagine restricting my pizzas to once per fortnight or so these days might constitute “moderation”. I have tried just about everything in my quest for the Great Pizza, including spelt (which I’ve also experimented with quite extensively in various flour combos in my SD bread). As I said, though, it’s not a favourite grain for me, and I far prefer the quality of the pizza dough I get from my cherished Allied Mills ‘Superb’ white flour, in terms of both flavour and crumb texture. Love whole grains in bread, but in pizza, after much trialling, I just have to accept that I’m a white flour man. A little rye can add some nice depth of flavour, and that’s about the only exception I make these days. Good conversation. Do send through those pics whenever you take them. Yes, the home baker certainly doesn’t need to know about my digestive system – talk about lowering the tone :-). Totally agree about using white flour in pizza, the same principle for garlic bread – whole grain garlic bread is a bit rubbish. I still can’t seem to source this holy grail of bread flour you mention in NSW so I’ll think i’ll play around with the spelt and see can I get some more air into the dough. All the best. Loved this. Have been perfecting the Fromartz baguette for quite sometime now, but took a hiatus due to housing situations with poor to completely broken ovens. Just moved into a new place with a great oven, started a new levain, and used it for the first time on this recipe. Pizza balls are in the fridge, can’t wait till day three. Cheers! Thanks for your comments, Benjamin – enjoyed them! Good on you, getting into baking-your-own as a student. Wish I had discovered home baked SD bread and pizzas way back then in my student daze. But it was a daze, and we come to what we’re supposed to come to when we’re supposed to. At least, that’s the rationalisation I’m using for now to excuse myself for all manner of retarded development, as time’s doors of opportunity begin to slam shut one after the other. As good as these SD pizzas are, I now make almost exclusively Forkish’s poolish/yeast version (from Flour Water Salt Yeast). Sacrilege, I know, to move from natural levain pizzas (or natural levain anything!) to dry yeasted, but I just can’t argue with the flavour and crumb/texture. It was a bit of a letdown, after so many years of tweaking my own pizza dough recipes, to discover one from someone else that tops the lot without tweaking, but there ya go! I just haven’t bettered Forkish’s dough, and it’s all about baking the best you possibly can, so he’s da man as far as I’m concerned, not I. Goddam it. Even worse, I have to admit his SD pizza dough also takes some beating! In fact, only his yeast/poolish version betters it in my homr pizza baking experience. I must add the disclaimer that I’m referring to the best to come out of a domestic oven. Add wood-fired to the equation and who knows? Do lemme know how your pizzas turn out! Very interested in making this pizza dough, however, your ingredient chart is not showing up on my computer. I’m getting some crazy movie list instead! Could you please re-post your chart? Hi Carla. Sorry about that. I’ve changed my blog design and some of the tables obviously haven’t made the transition correctly. Will investigate. BTW, the move review links are to my own reviews published on this site, so no need to fear spam or viruses or whatever. For some reason, the new table plugin I’m using is mixing up my move review archives with other tables. Will have to investigate. Might take a day or two, depending on time availability and what’s wrong. Stand by. There ya go, Carla – fixed. Pls check back in and let us know how your pizza turned out! I know this is beyond the scope of this blog but do you have any suggestions as to how I could (at a commercial level) have 40 or 50 pies sitting at room temperature without them over proofing? It clearly can be done as Varasanos is doing it. Does he just take his dough out of refrigeration 1 hours before service, if so, 2- 4 hours later the dough would be getting a bit bubbly. Scratching my head on this one. Feel free to let me know if I’m off topic. You guess is as good as mine, to be honest. I can say that I’ve found pizza dough to be far more forgiving of over-proofing than bread dough, and I suspect the end result wouldn’t be greatly affected – but only theorizing. Why don’t you try contacting JV? BTW, did u track down any Allied Mills ‘Superb’ flour, and if so how have you found it? I’ve been using good ol’ Laucke Wallaby lately, just because it’s available in the supermarkets and that means I don’t have to trek over to the Allied Mills wholesaler (30 mins away). Must say, the Laucke has been terrific in flavour and texture, both in SD bread and pizzas. I’d tried it before a few times, but wasn’t as impressed as I am now. Give it a go if you’ve finished your Allied Mills. HI Rolanstein. I contacted the supplier of Allied Mills and they didn’t see to interested in selling me one bag as I didn’t have a trade account. I’m still using spelt and loving it. Briefly flirted with Caputo but went back to Spelt. Will keep and eye out for ol’ Laucke Wallaby. Emailed JV twice but I’m guessing its a guarded secret. Still not getting the heat in my oven so looking at investing in now of these puppies – 500 degrees in 15 mins. Yeah, I saw the roccbox when Digital Trends wrote it up. It was still at the crowdfunding stage, but have to admit I was sorely tempted even then. I imagine there will be a hefty markup on it once it is retailed here. Still, if it’s as fast and clean as claimed it looks like a great alternative to a traditional WFO. I’ve wanted a WFO since I saw an early TV food show on traditional dishes as cooked in the family setting by various Aust-based ethnic cultures. Can’t remember the name of the show, but it was hosted by Melbourne-based chef Jacques Reymond and featured rustic DIY back yard “fornos”, which I just fell in love with. This was WAAAAY back before the “foodie” emerged and every yuppie decided a backyard WFO was an essential fashion accessory. Anyway, I was always hesitant to turn my dream into a reality because of the long heat-up time and the daunting task of DIYing – I wanted a rustic traditional oven, not one of those kit jobs with fancy ceramic decorations! Even toyed with the idea of starting a business building them with a mate, but at the time it was pre-internet and I couldn’t find ANY info on “fornos”, even via friends and contacts from ethnic backgrounds. Besides, it was a steep learning curve for a couple of brick-laying virgins like my unhandy mate and me, and the general consensus was that backyard WFOs would never take off here! Anyway, I have long felt that someone would come up with a better mousetrap, and it really looks like the roccbox is it. Where would you buy it from, BTW? Re your dough proofing question, why not chase down one of your local WFO pizzerias – you’ll probably find some doing SD pizzas now, too – and ask them? Funnily enough, no one is doing SD pizza in the East except for one guy and his reviews aren’t particularly good. I’ll figure it out – just gonna take time. WFO is the way to go – not just the sheer heat but the social aspect. The neighbours would be banging down your door. We had bbq SD pizza’s (on a stone) at a friend house and they took around 12 minutes – they tasted great but took too long. Hey Dan, long time no write, but if you’re still following this thread would love to know whether you went ahead and purchased the Roccbox. And if so, how you’ve found it?